Saint George’s Day is celebrated on April 23. The Roman soldier and martyr is best remembered for the story of his slaying a mythical dragon, which goes back to the popular collection of saints' lives in The Golden Legends. 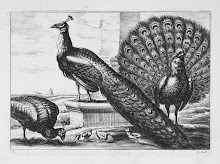 In his legend, compiled during the thirteenth century by Jacopo de Voragine, a dragon dwells by a spring in the city of Silene. The pagan residents needing fresh water appease the beast with animal sacrifices. When this does not work they sacrifice their children who are chosen through a lottery. Finally the fate falls on the King’s beautiful daughter and she is dressed as a bride to await her death. 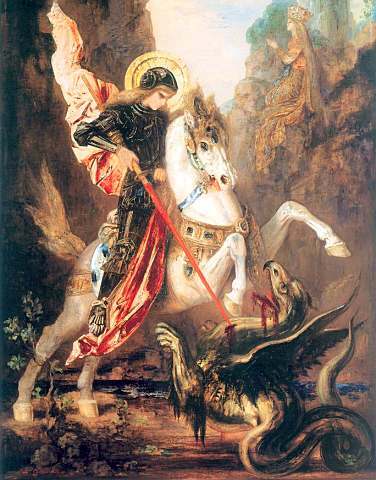 Saint George saves her by slaying the dragon and the kingdom converts to Christianity. The legend has its origins in the pagan myth of the Greek hero Perseus who saves the beautiful princess Andromeda from a sea monster. 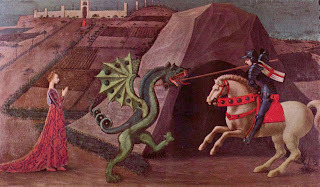 Paolo Uccello (1397 – 1475) the Italian artist and mathematician who painted in a combination of late Gothic and early Renaissance styles was apparently fascinated with the subject of St. George and the Dragon. Below center is one of the paintings attributed to him. French Symbolist painter Gustave Moreau (1826-1898), an admirer of the Italian masters of the Quattrocento chose the same subject. 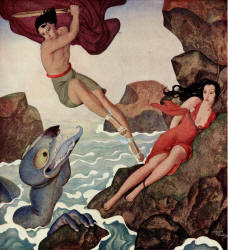 Golden Age of Illustration artist Edmund Dulac depicts Perseus saving Andromeda from the sea monster in the 1935 book Gods and Mortals in Love.